Photo Caption A: Michael J. Smith, President of Berkeley College (left), and Berkeley College mascot, Sir Berkeley (right), hold the finish line tape for a race during the U.S. Army Hispanic Games on January 7, 2017, held at The Armory Track & Field Center in Manhattan, NY. During the second day, 10 student-athletes were recognized with the Peter N. Aquilone Leaders of Tomorrow award for their achievements in athletics, academics and community service. Michael J. Smith, President of Berkeley College, accompanied representatives of the U. S. Army in presenting the awards to the student-athletes. “Berkeley College is honored to be a part of the U.S. Army Hispanic Games at The Armory, and to support outstanding high school athletes making a difference in their communities,” President Smith said. Recipients of this year’s Peter N. Aquilone Leaders of Tomorrow award represent educational institutions such as Beacon High School in Manhattan, NY; Bishop Loughlin Memorial High School in Brooklyn, NY; Elmont Memorial High School in Elmont, NY; Fordham Preparatory School in the Bronx, NY; Jamaica High School in Queens, NY; Manhattan Center for Science & Science High School in Manhattan, NY; Queens Metropolitan High School in Queens, NY; and Uniondale High School in Uniondale, NY. Photo Caption B: Michael J. Smith, President of Berkeley College (fourth from the right), and representatives from the U.S. Army present high school student-athletes with the Peter N. Aquilone Leaders of Tomorrow award for excellence in athletics, academics and community service. 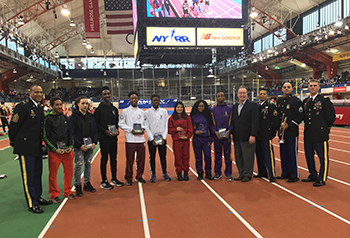 The awards were given during the U.S. Army Hispanic Games on January 7, 2017, held at The Armory Track & Field Center in Manhattan, NY. President Smith was also on hand to hold the finish line tape during one of the meet’s races with Berkeley College mascot, Sir Berkeley. Student-athletes and their families participated in contests and photo opportunities with Sir Berkeley in between matches, and were also provided free biometric screenings from representatives of the Berkeley College School of Health Studies. A leader in providing career-focused education since 1931, Berkeley College is accredited by the Middle States Commission on Higher Education and enrolls more than 8,000 students – including more than 600 international students – in its Master, Baccalaureate, and Associate degree and Certificate programs. Students can study in more than 20 career fields. Berkeley College is comprised of the Larry L. Luing School of Business®, the School of Professional Studies, the School of Health Studies and the School of Liberal Arts. The School of Graduate Studies offers a Master of Business Administration degree in Management online and in Woodland Park, NJ. Berkeley College has three New York campuses – Midtown Manhattan, Brooklyn and White Plains. In New Jersey there are five campuses – Dover, Newark, Paramus, Woodbridge and Woodland Park. Berkeley College Online® serves a global population. The website address is www.BerkeleyCollege.edu. The Armory is a New York City non-profit institution, with the mission of “Keeping Kids on Track.” Each season the Armory — the proud home of the NYRR Millrose Games — hosts more than 100 track & field meets and welcomes more than 125,000 athlete visits. 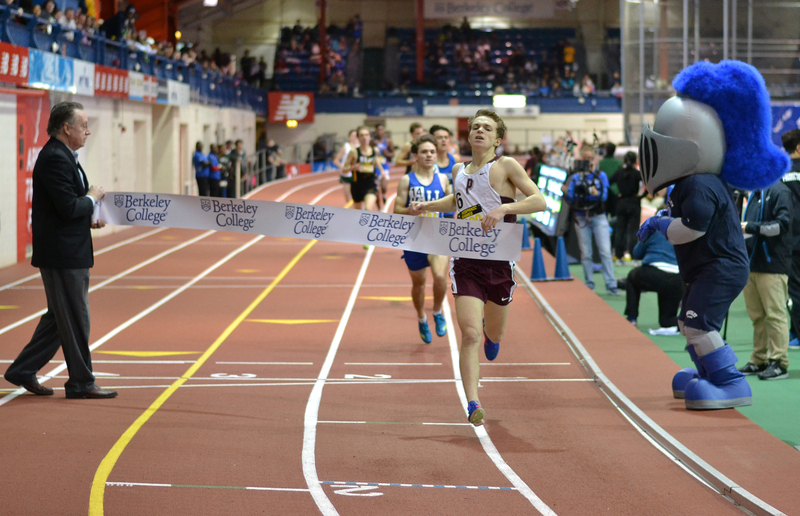 Besides its many youth sports and educational programs, The Armory runs the Armory Track Invitational Presented by the U.S. Marine Corps, the U.S. Army Hispanic Games, Artie O’Connor College Invitational, Armory NYC Indoor Marathon, the New Balance Games, and the New Balance Nationals Indoors. The Armory is also the home to the National Track & Field Hall of Fame. For more: Please visit ArmoryTrack.com.